I have just spent 3 hours compiling this Easy Guide to Learning the Linear C Syllabary for Arcado-Cypriot. There is nothing like it on the entire Internet. I have obviously done this for the benefit of those of you who wish to learn the syllabary, and for those of you who are already familiar with it, but who would like to see for yourselves just how elegant the geometric economy of Linear C is, even in comparison with Linear B for Mycenaean Greek. 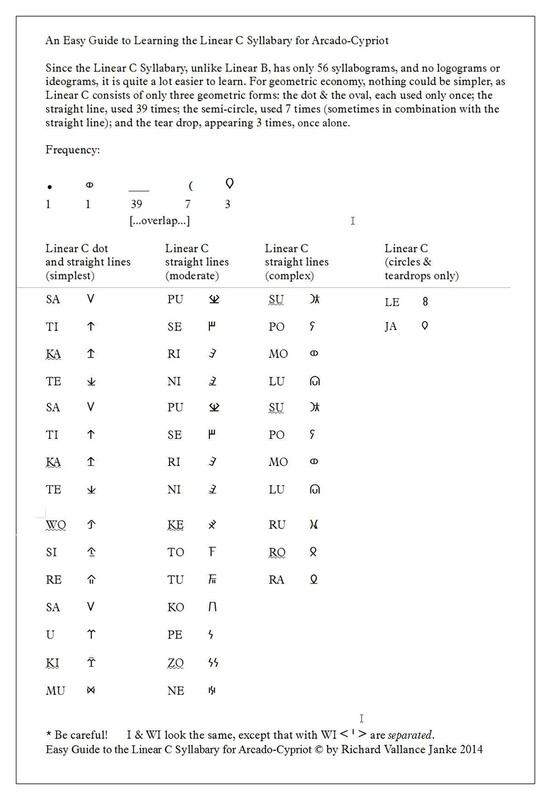 Linear C contains only syllabograms, whereas Linear B has 61 syllabograms, numerous homophones, logograms something like 100 ideograms, which makes for a much more challenging learning curve. In fact, Linear C represents the final step in the two syllabic scripts (B & C) before the various avatars of the ancient Greek alphabet were adopted ca. 800-700 BCE. And we must remember that the relative simplicity of Linear C allowed it to last from ca. 1100 BCE to at least 400 BCE, since the Arcadians and Cypriots could see no real reason to abandon what was after all a very easy syllabary for the Greek alphabet, although they did start using the Greek alphabet alongside the syllabary by about the seventh century BCE. The Idalion Tablet, for instance, is composed in both Linear C and in the Greek alphabet, the latter acting as a check on the accuracy of the Linear C syllabograms, and in turn, as we shall see later on this year, as a check on the Linear B syllabograms as well, facilitating more accurate translations of tablets in the latter syllabary. “The conclusion was already advanced that the new dialect was most closely related to Arcadian and Cypriot, as had been predicted...” (pg. 78) & again, “We know not only that the Mycenaeans were Greeks, but also what sort of Greek they spoke. They were not Dorians,... passim... But at least we can say that linguistically their nearest relatives were the Arcadians and Cypriots, and next to them the Ionians.” Thus, any attempt to correlate the East Greek Mycenaean and Arcado-Cypriot dialects with the West Greek Dorian dialect is bound to prove a failure. I WOULD LIKE TO NOTE IN PASSING THAT, AFTER ALMOST TWO YEARS OF MARKED SUCCESS WITH OUR BLOG ON THE INTERNET, ALMOST NO-BODY EVER TAGS OUR POSTS WITH “LIKE” OR FAVORITES THEM, OR FOR THAT MATTER EVEN BOTHERS TO RETWEET THEM MORE THAN A COUPLE OF TIMES, ALL THIS IN SPITE OF THE FACT THAT THERE IS NO RICHER SOURCE FOR SO MANY ASPECTS OF MYCENAEAN LINEAR B, ARCADO-CYPRIOT LINEAR C & THE TRANSLATION OF THE ENTIRE CATALOGUE OF SHIPS IN BOOK TWO OF THE ILIAD ON THE INTERNET. That this is a huge disappointment and source of discouragement to both myself and my research colleague, Rita Roberts, is an understatement, to say the very least. I sincerely hope that our devoted followers and other folks involved in research into Linear B & C will rectify this sad state of affairs all through this year, 2015. Have you guys seen Patreon? Some people may not be re-tweeting because they don’t have enough Geeky/Nerdy friends that would appreciate the content. However, I do think you are providing a valuable resource, and I cannot be alone in saying that I’d put my money where my mouth is. No we have not. But I clicked on your link and I shall join ASAP! Can you tell me a little more about yourself. I am delighted that you have stood up and taken notice of us. Our blog is now the SECOND-LARGEST blog on Mycenaean Linear B in the entire world, even though it is only 21 months old. We work our brains out trying to disseminate as much information and knowledge about Mycenaean Linear B and Acrado-Cypriot Linear C, not to speak of Homer and the Iliad, ancient Greek dialects etc. etc. Once again, I am pleased you have contacted us, and I thank you. Me? Not much to know. I’m a former history teacher. Probably more important to you, in terms of your demographic and audience, I’m a Pagan. I’m not sure how the numbers compare — secular Classicists versus Hellenic Reconstructionist Pagans and others interested in Academic resources because of spiritual practices, but it’s a market be aware of. I repost some of your articles when they directly comment on Minoan Deities, or on precursors to figures in Greek mythology, as that connects to the topic of my blog and Facebook page. What were you thinking, in terms of long-term goals for your writing? Were you looking to beat out the bigger blog, or are you looking to get published? Hi Thenea! Thank you so much for your background. Fascinating indeed. As for our near-future prospects here at LBK&M, we have a BIG BANG project in the works this year. I cannot say much about it quite yet, but if you click on the SUPERSYLLABOGRAMS tab at the top of the blog, you can read all of my posts on them. I am quite sure I have succeeded in deciphering another 5 % or so of the remaining 10 % of Linear B which has defied decipherment for the last 65 years, and this by following the techniques of my adored hero, Michael Ventris, whom I love so very much. I would like some friends to peer-review it before Rita and I publish it sometime (hopefully) later this year, and this does not mean just a bunch of ivory-tower academics. After all, just like Michael Ventris, I am an amateur linguist, whatever that is supposed to mean! Anyway, try and slog through our SUPERSYLLABOGRAMS section, and see if you can understand what I am up to in my devilish little mind, ha ha! I was not sure if I was following your blog, so I went there, but I cannot find any FOLLOW button on it. HELP! WordPress can be a bit of a labyrinth. If you are logged in, there is generally a utility bar at the top of the browser. Otherwise, if you look in your comments section on your dashboard, there should be a tiny little circle next to my user name which will turn into a check mark when you click it. I followed you new blog, and I will take a look over there when I get a chance! To be completely honest, neither am I! The system can and all too often does drain the passion out of folks. OK I shall try to see if I can find the follow button in your comments section, and if I cannot, I shall leave another reply here. OK. Thanks for following us. I shall start posting a series of articles on the Decipherment of Linear B Supersyllabograms in a few days. It will take much of the winter and spring to post them all, and after that, Rita and I will need to have them peer-reviewed before we publish them, just to be sure. I can tell you one thing already. Of the 61 Linear B syllabograms, fully 31 are supersyllabograms! That is an astonishing figure in and of itself. Just click on the section heading, SUPERSYLLABOGRAMS, at the top of the blog, to check on any new developments. Your feedback on how well and how clearly we manage to get the concept of SSYS across to GENERAL readers is highly appreciated and greatly valued. Hello Thenea. I would just like to add my thanks here on Richards blog for your nice comments. Also, I note that you are interested in one of my main subjects Pottery ! Do you mean Ancient pottery or just making pottery. ? By the way I am following your blog. Regarding the pottery? Both! I feel that a lot of times, ancient pottery can tell a story that may not be extant in the written history or mythology. Presently, I am attempting to replicate the bell krater shape, and the stemless kylix. I’m not exactly a skilled painter, but I am hoping to paint them red vase style. I’m also developing a greater appreciation of ancient pottery through learning to produce these forms, and gaining an understanding of how the ancient pottery forms were probably constructed, based on logistics. It’s nice! Nice to see you and Thenea chatting too, Rita. She seems so very personable to me. That is entirely true! And sometimes the story on the pottery can complement the information (or more likely, the APPARENT lack thereof) on the tablets. Oh that sounds wonderful! Be sure to show us what you have managed to do with your replication. Your approach to replicating ancient pottery by means of logistics sounds very sound. I am always impressed by fellow researchers who really put the xe to the grind, and you certainly seem to be doing just that, Thenea. I wonder if I have invited you yet to participate as an AUTHOR on our blog. IF NOT, let me know ASAP, and I shall invite you. (All posts are moderated by myself). Thank you very much! I’m still working on nailing down the forms, but I would be delighted to share with you some of my research once I have more that I’m confident in showing. I agree Richard. It is a big disappointment considering all the work you put into this Study. Damn right! It is a pain in the arse, if you ask me. I have to wonder why folks do not appreciate what folks like you and I work so hard to achieve. Anyway, such is life.